Though Art Week is typically focused on the buzz of Art Basel and the numerous satellite art fairs that dot the city, there are a number of museums and local galleries with can't-miss exhibits. 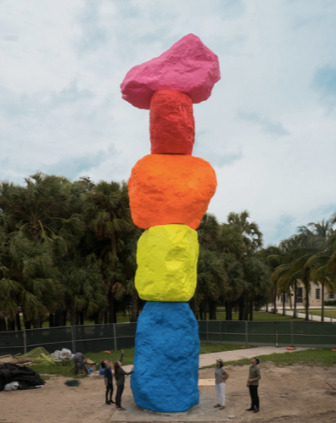 This year, the 20 sculptures in the Art Public exhibition on the lawn of the Bass Museum this year are curated around the theme “Ground Control.” Among the works are a glow-in-the-dark lamppost by Wagner Malta Tavares, a pair of giant arrows by artist Tony Tasset and Ugo Rondinone’s you-can’t-miss-it neon “Miami Mountain,” a piece that was recently acquired by the museum. The museum, which meant to reopen this year after an extensive renovation, will open in the Spring of 2017. 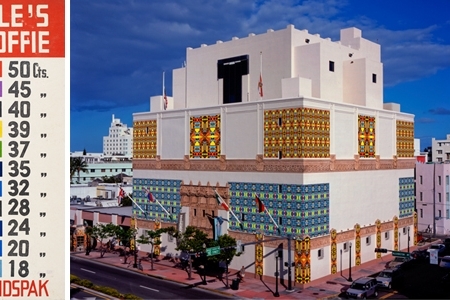 Bass Museum, 2100 Collins Avenue, Miami Beach. Free tours at 2 p.m. daily. Now in it's fifth year, he Miami Street Photography Festival takes over a gallery at HistoryMiami Museum and features work from photographers of more than 50 countries. It's mission is to give exposure to up-and-coming photographers from around the globe while highlighting some of the best in street photography. Featured guests include legendary photographers Alex Webb, Rebbeca Norris-Webb, Jill Freedman and Matt Stuart. German Pop artist Thomas Bayrle's first US solo museum exhibition, "One Day on Success Street" opens at the ICA Miami. The first museum presentation dedicated to the artist features over 75 works from the 1960s through the present day. Wire Madonna, the artist's largest sculpture to date, was commissioned by the ICA for the museum's unique Atrium Gallery, and depicts a madonna and child in steel. This will be the last exhibit in the museum's current location. Locust Projects hosts Alexis Gideon & the Glacier - a video opera by the Pittsburgh artist combines music, video, animation and paintings on glass. The non-profit also opens an installation from the Huffer Collective, including works by locals Ahol Sniffs Glue, Swamp Dog and Jason Handelsman. Gallerists Jeffrey Deitch and Larry Gagosian join together for an exhibit titled Desire curated by Diana Widmaier Picasso. Located at the Moore building, “Desire” features approaches to eroticism by some 50 modern and contemporary artists, from Pablo Picasso to Marilyn Minter. YoungArts partners with Rolls-Royce to present a solo exhibition of new paintings and sculpture by José Parlá called "Roots. It was curated by Laurie Ann Farrell and takes place in the JewelBox. For art week Nina Johnson opens Awol Erizku’s first solo exhibition at the gallery I Was Going to Call It Your Name But You Didn’t Let Me. Presenting a group of 20 paintings alongside a conceptual sound collage of music and sonic ephemera, Erizku traffics in the space between sound and sight. The works center around the same figure, a disembodied hand holding a rose. The Perez Art Museum Miami exhibits the largest survey of Argentinian artist Julio Le Parc’s work in North America. Featuring over 80 works, the comprehensive exhibit features large-scale installations and rare works on paper. The Rubell has three exhibitions up during Miami Art Week: "High Anxiety," featuring new acquisitions from 32 artists including Ryan Trecartin, Simon Denny, John Waters and Kathryn Andrews; "New Shamans/Novos Xamas" with 12 emerging and mid-career artists from Brazil; and "Video Art in Latin America," a preview of the upcoming Getty Research Institute's massive show "Pacific Standard Time: LA/LA" that will run from September 2017 to December 2018 at over 70 cultural institutions across Southern California. Spinello Projects presents Naama Tsabar, in Transitions #3, the Miami debut solo exhibition for the artist. The gallery will show three evolving bodies of work that explore human behavior through the relation of body and space. The Wolfsonian-FIU has launched a Kickstarter campaign to help fun their largest work to date, titled "More is More" by artist Christie van der Haak. The piece will cover the facade and lobby of the building in Haak's batik-inspired patterns. At night her vision will be enlivened with nightly projections of additional geometric designs in vivid color. The museum is also currently has an exhibition of Dutch design and another focused on surrealism titled "The Pursuit of Abstraction."